I have started writing a book. Sadly, I tend to do much better writing blog posts. Blog posts are generally thematic, but shorter and independent of each other. I’m not going to do as some “authors” have done and create a book that is just a collection of blog posts (that can be read for free). The topic of the book was going to be how the various denialist groups use similar tactics. Creationists, anti-GMO, anti-vaccine, and anti-AGW and many other smaller niche groups use tactics that are surprisingly effective, while being completely wrong. Since a few very well known writers have also done this sort of book recently, I’ll just make some posts about them here. This first post is about two very basic tactics in print and on-line debates: The Gish Gallop and Goal Post Shifting. The first of these is what I consider the most fun and it’s really quite effective if you aren’t watching for it. The Gish Gallop is named after the late Duane Gish, a young Earth creationist and vice president of the Institute for Creation Research. Dr. Gish (biochemistry, UC Berkley – 1953) was, without a doubt, a fine speaker and debater. If reality was determined by debates, then I would be writing this book to laugh at the evolution supports, largely because of Dr. Gish. The tactic, named as such by Dr. Eugenie Scott, is when the debater basically flings so much crap out that the opponent doesn’t have a hope of addressing all of them. In a 45-minute debate opening, Dr. Gish could make a hundred or more claims. He doesn’t discuss evidence or support any of the claims. There’s no evidence that the claims are correct. In almost every case, there’s no evidence at all. But the point of the Gish Gallop isn’t to talk about evidence or even discuss a concept. It’s purely a debating tactic. It’s a way to score points in a system that awards such things. Actually, my understanding now is that the Gish Gallop isn’t as effective a debating technique, in formal debates with points awarded. But for the debates or even talks that Duane Gish was a part of, that didn’t matter. It sounded good, especially to people who were already predisposed toward Dr. Gish’s position. The problem is that science is hard. It’s full of details that the vast majority of non-experts couldn’t care less about. When someone is trying to explain why a particular claim is wrong, there has to be a lot of detail. It becomes , not a simple few sentences in a debate, but a full on lesson in some fundamentals of science. About a year ago, I read a website that talked about the “assumptions of radiometric dating”. The intention was that this would cast doubt on how scientists know the age of Earth or particular fossils, somehow making a 6,000 year old Earth more likely. I just described the entire argument in two sentences. There were no references, not even to creationist works. There was no logical discussion or even facts. It was nothing more than a bare claim. Yet, to refute this bare claim, I wrote over 2,000 words and had two diagrams. Now, take a minute and say the preceding paragraph out loud. That’s how long it would take to say in a debate. Now, read, aloud, these two entire blog posts (carbon dating and isochrons), which is what it takes to refute the claims made in five or ten seconds. It’s easy to see why this is such an effective debating tactic. In any debate with a time limit, it’s simply impossible to deal with a hundred claims thrown out. In a 15 minute rebuttal period, I’d be surprised if even two claims could be dealt with in a partially satisfactory manner. The tactic is effective in written discussion as well, especially those with a word limit. A few sentences with claims are easy to type. It can take days of part time effort to, look up references, craft a response, and refute those claims. In an online forum, by the time such claims are refuted, the opponent has dropped thousands of new ones. The ability deal with this tactic rests almost solely on the amount of time and effort the respondent is willing to spend. I would venture to say that many books have been started in this manner. Personally, I find this unsatisfactory though. I think that we should take the time to explain these things. The reason for this is that, if you have someone that’s even potentially listening to what you say, then you should take the time to refute their claims and show why, in detail, they are wrong. If there is a chance that we can teach someone valid science, then I think we should take it. To not do this is to longer be a teacher and I think that every scientist is a teacher. One really nice feature of blogs and on-line forums, of course, is that these refutations really only have to be written once. From then on, people can just link to those refutations. Of course, this process of having a detailed explanation leads us directly to the next denialists tactic. Imagine a soccer game. This is a highly contested game, perhaps a playoff game between two really great teams. Tension in the stands is high. The red team has been the victim of what appear to be some bad referee calls. The blue team (and the crowd) is on the verge of tearing the whole stadium down. In the final minute of the game, the red team kicks and scores, tying the game. Before anything else can happen, two of the referees walk over to the goal, pick it up, and move it over. When they set it down, the ball is not in the scoring zone. The referees declare that no points were scored and the game is over. The blue team wins. I don’t think that there’s anyone who would think that is either fair or valid. Yet that is exactly what happens in what we call a goal-post shift. In this situation, the denialists make a claim, someone refutes the claim, but the denialists then says, “but that doesn’t address X” where X is something that has nothing to do with the topic at hand. My favorite example of this comes from the Amazon.com discussions. 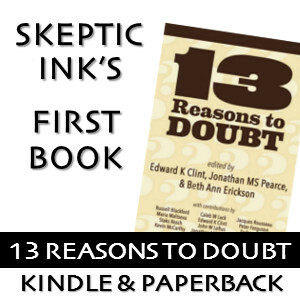 In June of 2013, creationist Stephen Meyer released his book Darwin’s Doubt. This book was advertised (as all such books are) as the end of Darwinian evolution. In the book, Meyer takes us through the Cambrian explosion, conveniently leaving out a significant amount of material. After the book was published, everyone pretty much ignored it. The Discovery Institute (Meyer is a senior fellow there and the director for that organization’s Center for Science and Culture) claimed that scientists didn’t refute the work because they couldn’t. Donald Prothero, a paleontologist, took up the gauntlet and wrote a scathing review of Meyer’s work. The review appeared on Amazon.com and Prothero’s blog. The next day, a pro-creationist commenter at Amazon wrote that Prothero didn’t address early embryological development and just mentions epigenetics in passing. It should be obvious that a discussion on epigenetics and embryological development is not within the purview of a paleontologist. Dr. Prothero probably knows something about these areas, but he’s known as a paleontologist and addressed the paleontological shortcomings of Meyer’s book. As soon as he did so, the creationists were no longer interested in talking about paleontology. Quite inexplicably, they were only interested in two areas that Prothero didn’t address and, no offense to Dr. Prothero, isn’t an expert in. The goal post shift is, unconsciously, an act of desperation. The shifter knows that their arguments have been refuted and the only way to save face is to get away from the topic which is causing them grief. Let’s take a brief aside to talk about that last comment. In my years in the trenches with creationists, I have noticed a very common trait. This trait also appears among politicians, and other people who are blinded by ideology. That is, they absolutely, cannot admit to being wrong. These are definitely exceptional examples, but the complaint is very common. Anyway, the goal post shift is purely to do anything to counter the refutation. It’s also an admission that the refuter is correct. There’s nothing to be done about the refuters claims and evidence. They are correct. I will say that, in denialist circles, the Gish Gallop and goal post shift are absolutely more common in creationist works than anywhere else. Although, the goal post shift does often appear in anti-GMO and anti-AGW work. The Gish Gallop makes rare appearances in anti-AGW work. The Gish Gallop is effectively countered (in print, on-line, and speaking events) by two demands. The first is that the discussion stay on one topic. The other is demanding that the person provide evidence for the claims presented. Now, in all my years of making these two demands of creationists, not one has ever actually responded to, much less performed these requests. However, it can be quite enjoyable to remind them over and over and over that they still haven’t provided evidence for their original claims. One thing I often do when having these discussions is write down a list of questions, requests for information, and the like for the opponent in a text file. At the end of every reply, I will say, “and you still have yet to address these issues” and paste the text from that file. Note that this is also an effective counter to the goal post shift. This pasting of points reminds the opponent that you have not forgotten the things that they said and that it is up to them to support their claims. If they cannot, then there’s no point in refuting them. Really, who is going to spend a couple hours and several thousand words refuting the claim that the moon is made of cheese? After a few days of this, you can begin to expand on this by saying things like, “So, since you haven’t provided the evidence, we can assume that this is a meritless claim and will ignore it from now on.” And then, when that person brings up this point in a few weeks or months (and they will, just as soon as they think everyone has forgotten about the last time), you can remind them with that massive list of questions and requests for evidence. For the goal post shift, it’s often just easier to remind them what their original claim was (paste text and link to the original) and that this new claim is different and not covered by the responses. You can also say that since the claim is changed, they have implicitly agreed that the first claim was wrong. There have been on-line debates that have gone on for more than 3 years. And the creationist still does this. After more than 3 years. Theses requests and responses by you will not change how they act. The point is not to convince someone who is so dogmatic about their beliefs that no evidence will ever convince them otherwise. The point, especially in public discussions, is to remind people who are silent but reading, that the opponent’s claims are meritless. Next time, we’ll talk about Forced Ambiguity and Cherry Picking. Epigenetics is the study of heritable changes in genes that are not caused by changes to the DNA itself. A very nice discussion of the gallop and the motorized goal posts. I look forward to the book! I hear Prothero’s is very nice. I’m just not a book author. I’ve got about 35,000 words and I’m out of filler ideas. It’s more like a big pamphlet. On the bright side, I’ve got a dozen blog posts done. This piece is being shared in animal welfare social media, and it’s hit a nerve! These two tactics are probably as common in the Animal Rights movement as in creationist circles. They are often expressed in other common tactics – the Straw Man argument, and Killing the Messenger, Dehumanizing the Opposition opening the door to Demonizing animal owners. Huge lessons in cognitive dissonance, very entertaining sometimes, always frustrating. Fascinating. I don’t run in those circles, but I’d like to hear more about this. You sound like just the kind of person who would be a great presenter at the next National Animal Interest Alliance (NAIA) conference. It will probably be next November, it will certainly be held in Orlando. The NAIA is a grass roots powerhouse for animal welfare – as opposed to animal “rights”, the bod is a bunch of overachievers in science, education, agriculture, research, law, every aspect of our society is represented. You’d be amazed at how animal issues are intertwined with everything human. Our health, our economy, social and legal issues, it’s intense! Our underlying problem is based on anthropomorphism. Animals as little humans in fur coats. The comment just below, from “regulatesheltersand rescues” nails it, why we must do battle every day against these “history deniers”, these idealogues. We will never change THEIR minds (yes, you are right, they cannot admit they are wrong – or “mistaken”), but every day there is an opportunity to educate and enlighten people we don’t even know are reading this stuff. Social media is the perfect audience – Short Attention Span Theater, live. I’m certainly available for speaking. One thing I’ve found is that countering these fallacies and presenting good arguments doesn’t change minds. No one (that I would trust) will read one blog post and instantly change their own mind. But it sets a seed. Over time, decades in some cases, you can change people’s minds about important and closely held issues. The animal welfare vs animal rights debates easily turns ugly. The evolution vs creationism debate seems civilized, by comparison. Animal extremists have a sordid history of violence and destruction, so there is a certain amount of anxiety running through everything, a chilling effect on discussions, some urgency to get the word out, change the conversation to something more positive. Another thing we face is the fact that we can be our own worst enemy, which the radicals thoroughly exploit. I shared your blog on my Facebook page just a couple of hours ago, after getting it from a New York City horse carriage driver, and soon the social media exponential factor will kick in, and you will find a lot of appreciation for your clear explanation of the typical behavior of animal terrorist tactics. There was a recent arson fire of a horse carriage stable in Chicago that destroyed the carriages, but no people or horses were hurt, luckily. As with any fire, especially arson, the fact that the horses survived was pure luck. There was “free the horses” graffiti painted on the inside of the building that wasn’t there when the owners locked the doors in the evening. The radical groups are saying that it was an “inside job”, set to discredit the animal rights groups. That’s what I mean when I say these debates turn ugly – especially when the extremists start to lose, which is what is happening in New York and Chicago. Thank you for giving us something to share that will help us help others to recognize and understand this and realize what’s at stake. There’s a few creationist who will track people down and try to get them fired or something. And I’ve received threats,,, but it’s not endemic of the creationist mind set. Oh my YES! All the PETA propaganda and followers, individual vigilantes on social media against pet ownership, retail rescues. I could go on and on. They all revert to name calling and goal post shifting to discredit any opposition when they are cornered with the lack of actual evidence to support their views. They also enjoy “emotional self-pleasuring” (for lack of a better term) that somehow gives them the impetus to continue the “debate” long after any relevant points have been made. And how right the author is that we cannot hope to change the extremists minds but have to use the refuting tactics to educate the undecided public. Thank you for explaining these 2 methods, used by people who are ignorant, and prefer to stay that way. I will save this link to your blog for future use. Something else you said has been floating behind my eyelids for a bit – “science is hard”. The most frustrating thing about the animal rights quasi-religion is the simplicity and shallowness of it. The most militant groups consist of a few different platoons, so to speak, with various goals and motivations. The most extreme are driving the locomotive towards the extinction of domestic animals, fueled by big money from vegan organizations like the Humane Society of the United States (HSUS), PeTA and to a slightly lesser extent, the ASPCA, the big one. The ASPCA aren’t strictly vegan per se, but there are a lot of vegans on their donor list, and their focus is mainly on pets and horses, while the other groups cover livestock of all types as well as zoos, wildlife management, aquariums, working animals, entertainment and such. Yes, they want all of that GONE, total separation between animals and humans. Based on cruelty, the only marker they use. It all started with PeTA and biomedical research with animal studies, so researchers have a lot to teach us “pet people”, they have suffered incredible violence and destruction. The thing that’s so hard to take is the almost total lack of credentials in any of these loud and obnoxious groups. They are lazy and cheap. No expensive degrees that require study, exams or practical experience, no need for ongoing studies to keep up with new discoveries, no animal related expenses at all. They need no expertise. And in fact, they have convinced the public somehow not to trust the people with credentials by lying and manipulating us with emotional images and words. And they also have a lot of free time to promote their agenda while the rest of us are busy (working our asses off is more apt) taking care of our animals and our continuing education. They follow to the letter the plan laid out by Goebbels, Hitler’s propaganda minister, with some modern tweaks alá Alinsky’s Rules. Yep – cheap and lazy. With one exception – the millions the animal rights groups spent to elect a mayor in NYC who promised to get rid of the Central Park carriage horses is going down the drain, in direct contrast to the grass roots efforts to save them. I don’t know where you are located, but if you are anywhere near NYC this weekend, you should stop by Central Park – there is a celebration/open house happening, Clip Clop New York! http://clipclopnyc.com/ This kind of event is our positive, enjoyable answer to the cheap and lazy cretins who attempt to discredit science, psychology, the human/animal bond and the full circle of life on our planet. Yes, I have noticed that too. While some of the head creationists are Ph.D.s, they use very simply math and basic logic (fallacies) to get their point across. Mainly to people with very little science and critical thinking background. Creationism has an advantage in that regard… a large group of people who are already gullible and listen to authority. The other groups tend to be very emotional based (anti-GMO and anti-Vax for example). That sounds kind of like what these animal groups are doing. This is really fascinating. If you would be interested, I’ll happily give you a guest post to lay out this kind of thing. That sounds interesting, let me think about it. If I can have a couple of months to organize thoughts, I’d like to do that. I really appreciate the offer, it is so important to raise awareness on such an important issue. We are always, it seems, preaching to the choir . . .
Of course. If you use the contact link at the very top, you can send me an e-mail message. Take your time… and only if you want to.